Get distribution application and open it. Installation of standards and of the users is. For successful installation, you must have administrative rights. After the installation run the application. If the login and password are entered correctly, open the main application form. Shipment of goods in the negative "
If the user does not have access to one of the operations listed above, but there is a right of access to follow-up to the cash register, the application will open it just a form of the outcome of the cash register. 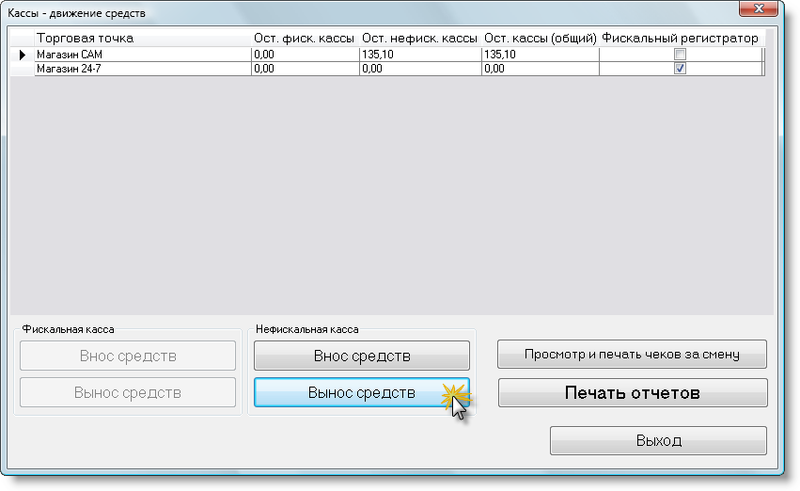 If implemented login cashier with a full list of rights, but with the office was previously (after the formation of Z-Report) open another cashier, the new treasurer will not be able to work on the job until the cashier did not close the previous shift (do not Z-Report) or instead of the will not make another user with access to follow-up to the cash register. If log in ShopDesk undertook the user does not have a complete list of the above rights rights, but he is the administrator of the accounting system, the application will open it only form of application settings. 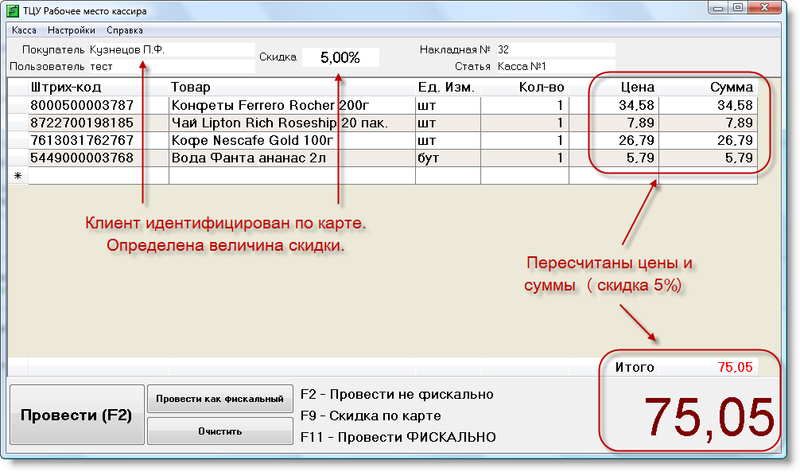 Do not forget - the right Users are delegated to RMK from the main accounting system. These and other user sets the system administrator account. Cursor is placed in the "Barcode". Scan or enter the scanner bar-code product. In the test database has several products with bar codes - You can see them at the next picture. If you want to edit amount of goods - click on the keyboard cursor keys "Up", enter number and press "Enter"
When entering the check is finished, press the button on the keyboard "F2"
In the received from the client, enter the amount that gives the buyer. For exception of mechanical errors that could allow the cashier to the reception pay, a button "to bill" will not be activated if the amount received funds from the customer less the amount of payment. Connection String - the string connect to a database that is formed through dialogue 'Internet connection with the data. "Dialog is called from the button "...". Connect to the database described in Help Topics Dialog Properties related to data "
Recipient on the goods default - the buyer, who will set the cost waybill. 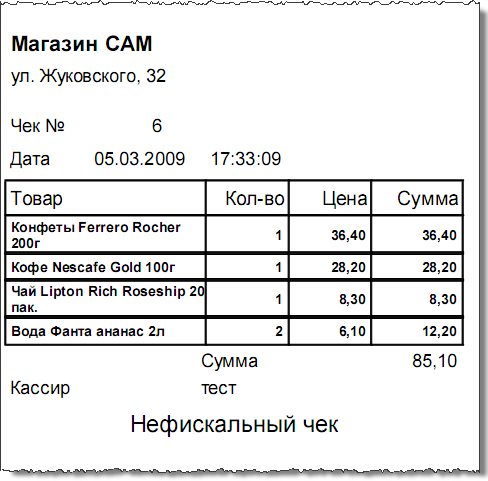 Typically, the buyer uses an abstract "Retail"
Store Name, address of the store - details at the store printed check. Allow printing non-fiscal receipts - the inclusion of a disabling Printing checks on each authorized check (bill). Width check - the choice of size check for different types of printers. Check must be approved as a tax. Require reason when you delete - when you remove the lines and cleaning up the check (prior to the approval of the check) cashier will be prompted to enter a ground for removal. This authority will stored in the journal Action cashier. allow shipment of goods in the negative " -- set checkbox prohibits the inclusion of a check in the goods, which zero or negative balance on this account system. This right is under another (the parent) the right to the cashier with a similar name and is described in Help Topics structure base db_gate , and without which Work with a cashier can not do. List of available outlets for RMK - in this list are those outlets that are served by job cashier. That is, the sale of goods is only possible with these outlets, the goods the remaining outlets will be available. To add a point, click "Add" and select the necessary outlets. Also, if need to mark it as a fiscal and save your choice. If the list outlets will be available without a title, it means that the outlet is not in the connected database (perhaps it is from the previous database) and it should be removed. Remove the button "Delete" pre-allocating it to the list. Remember, shop, you can delete only the if the balance in the box office (fiscal and non-fiscal) is 0. Maintenance Fund. Contributions removal tools. Cash Reports. After bring in non-fiscal balance of the sum of cash outlet "store AMU" will increase by 50 UAH (up to UAH 135.10). -report, which will reflect the transaction. If the X-account can be done repeatedly during the working day, the Z-report is done once, at the end of shifts. It is the totals for all transactions made during the shift: the sum of all contributions, the amount of revenues and the amount of leaching. When you release this report in the system deletes all the "wiring", ie information about the goods sold, issued checks operations bring in and take out funds. Cashier's Office is prepared to work the new shifts. In addition, the release of the report calls for a zero balance at all ticket offices. 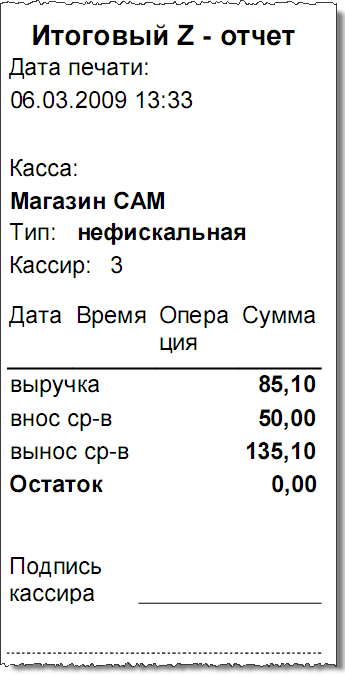 prepare cash for closing shifts - will make the balance (135.10 UAH) from non-fiscal cash outlet "store AMU". Should be noted that the rebate check is carried out only when you use a discount card in the manual mode, the cashier does not have a chance to fix retail prices. To enter a discount card, press "F9". Scan scanner, or manually enter the card number. Practice shows that the cashier at the workplace, in addition to the sale of goods from the shelves, actively carried out the sale of related products such as bags (various sizes), or any other products, with and without bar-codes (bread, cigarettes, chewing, chocolate). In doing so, the cashier for the speed it would be convenient to have a tool that would quickly put in check a product. 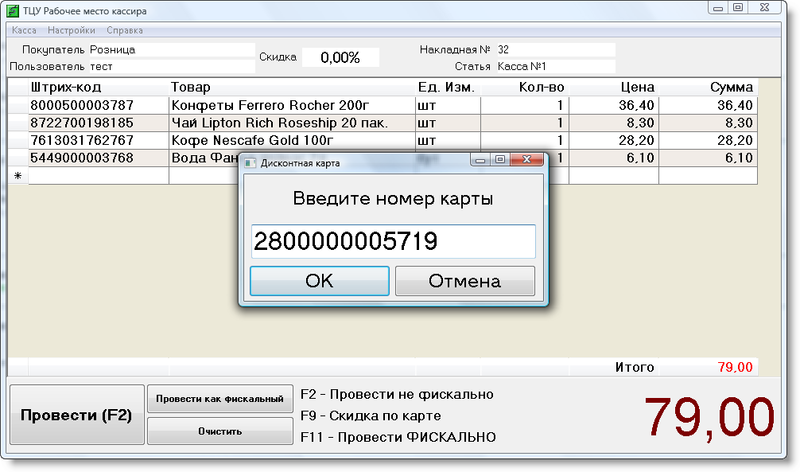 ShopDesk is possible to fasten the buttons for the normal keyboard barcode. Cashier to press the button associated with any commodity, and the check gets his bar code, for which the normal pattern the system recognizes the goods. 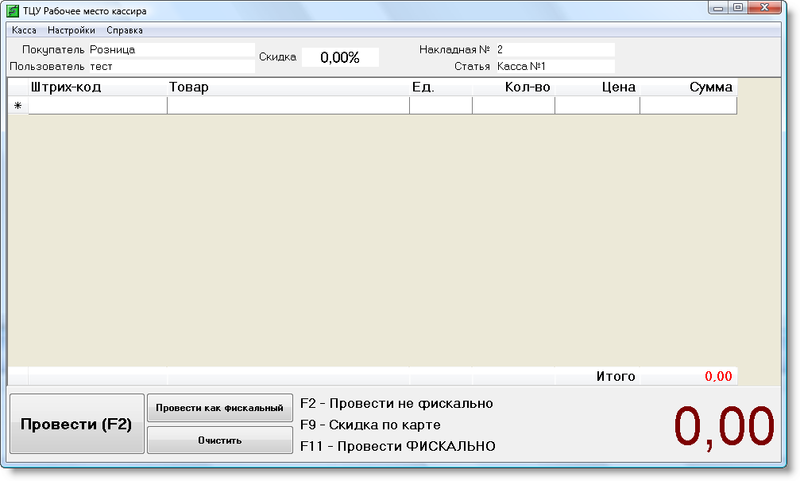 Access to the form through the settings menu, "Keyboard" application ShopDesk. List button keypad and associated products can be printed and placed at the cashier in a conspicuous place. Print can be A4 format or directly to the check printer. 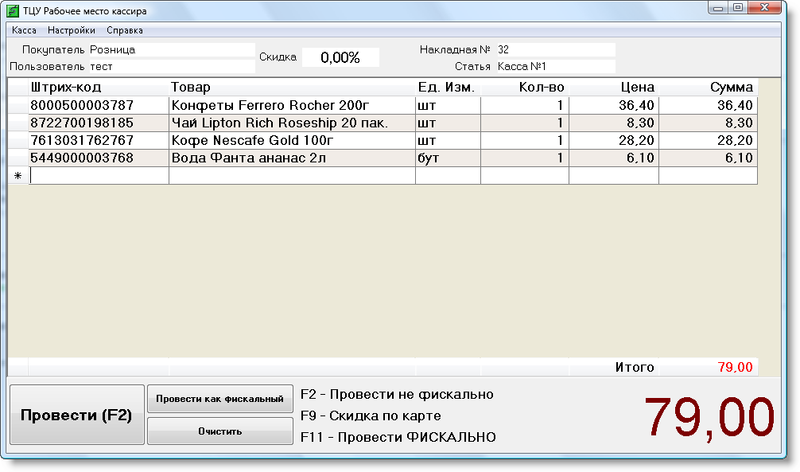 ShopDesk An important feature is the log of actions. In the magazine (formed on each day and each cashier separately) recorded virtually all steps in the recruitment of a cashier check, adjust the number of sold goods, removal of goods from a list or a full clean-up check. Fall into the magazine well as the action on to contribute to the cashier and the removal of funds from cash registers, printing reports, some service information, etc. The log file format is "csv" and may be open to review by the system administrator ordinary text editor or Microsoft Excel, or other application that supports this format tabular data. 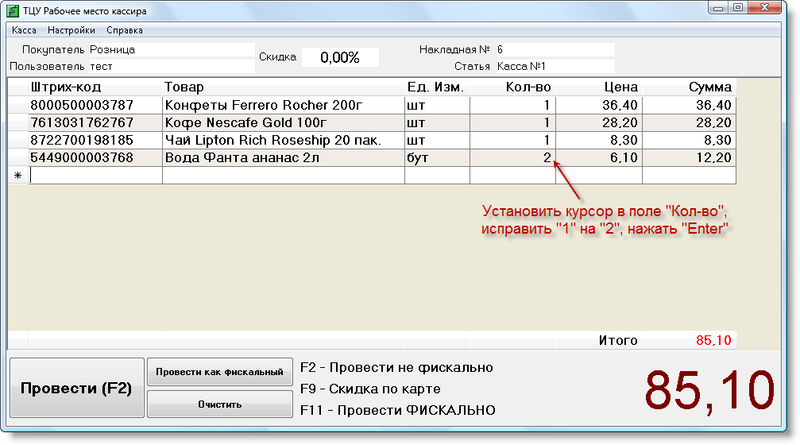 More detailed description of all features and options ShopDesk contained in the certificate included in the distribution, as well as online help.